♥ Gemma C contacted us to make some customised badges for a hen night. We sent her a proof for her to show to the other hens. She changed her mind at least 3 times as the hens could not decide which design to go for. She said that we were very understanding keep sending proofs through. We told her that this was all part of the service we provide. If our customers need assistance then we go that extra mile to make sure they are happy with the product and the whole purchasing process. ♥ Nicole contacted us with a problem. She wanted customised badges with photos. But the only photo she had included other people in the shot. She only wanted two of them and these two to be on separate badges. This was not a problem. We adjusted the photo and sent proofs and she was delighted. The order was despatched. ♥ Jack G's son phoned us to enquire about a customised rosette for his father's 80th. A lifelong football fan - he wanted a rosette in their team colours, with his age, photo and name. That was an easy one as we make all the rosettes ourselves. Jack celebrated his birthday complete with rosette. We look forward to doing his 90th ! ♥ Jenny D needed rosettes for a hen night and needed them quickly, as the bridesmaid had ordered some from another company but they were poor quality - cheap ribbon and simple pleats. As we make our own rosettes we put her mind at rest, about our quality. We sent her a proof so she could see what she was getting, and she was delighted with the quality and next day delivery. ♥ A special winter event was taking place and the organisers wanted sashes for the officials. As these ranged from juniors to adults, wearing all kinds of outdoor clothing. Different sizes, various amounts of clothing - so obviously a standard off-the-shelf sash was not the answer. So each sash was designed with the wearer in mind. And then with adjustable Velcro-type fastening the sashes fitted perfectly with each sash clearly displayed their message. ♥ Sarah called on Wednesday to say that she had been let down by another company. She needed an urgent order of sashes for Friday. We were able not only to help but also she received her order next day. ♥ Lucy S had ordered sashes from another company on the Internet and was not happy with the ribbon quality or the way they had been printed. She contacted us and we were able to send her a proof so she knew exactly what she was getting. She was thoroughly delighted with them and wished she had contacted us first. ♥ A local youth group just needed 6 lanyards, but they wanted the club name and also their name on them. A small quantity isn't a problem so well within their budget they all got their own customised lanyard. ♥ Another association didn't want customised lanyards - just a good price and quick delivery of lanyards with their logo. Due to the fact that we have several options, depending on whether you want high quantity or low volume customised lanyards we gave them what they wanted. ♥ A company contacted us to make some lanyards with a logo and writing, but couldn’t decide on the colours – as this was a large quantity we were able to send them samples so they could make up their mind. We also offered them payment on invoice (which most companies prefer) supported by a purchase order number. 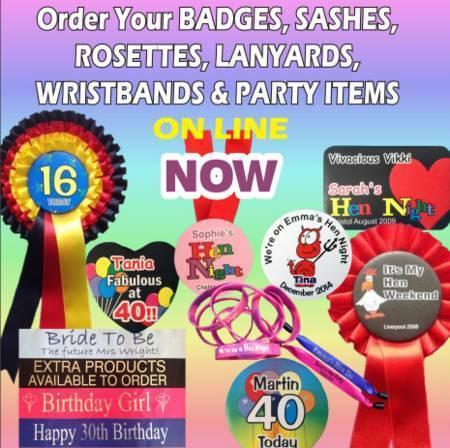 ♥ Kaytie wanted silicone wristbands for her hen night - but only wanted 25 - and also wanted them customised to her event. Whilst this small quantity does result in a slightly higher price than if she had wanted 100, we supplied her with what she wanted - and still at a very good, affordable price.